Set an appropriate layer current. If all objects in the block definition reside on one layer, you should usually insert the block on that layer. If the block geometry spans several layers, choose a suitable one to insert the block on. For example, a block that shows a gearbox made of geometry on layers named Casing, Armature, Shaft, and Fasteners, for example, would be inserted on a Motors layer. If any of the block definition’s geometry was created on Layer 0 (zero), that geometry inherits the color, linetype, and other object properties of the layer on which you insert the block. On the Home tab of the Ribbon, click the Insert button on the Block panel. The Insert dialog box appears. Use the Name drop-down list to select from a list of block definitions in the current drawing. Click the Browse button to select an external DWG file and have AutoCAD create a block definition from it. Browse to any existing drawing and insert it into the current drawing to create a new block definition within the host drawing. The new definition retains no connection to the inserted drawing. You can use an external drawing to replace a block definition in the current drawing. If you click Browse and choose a file whose name matches the name of a block definition that’s already in the drawing, AutoCAD asks you to confirm the update and updates the block definition in the drawing with the current contents of the external file. Enter the insertion point, scale, and rotation angle of the block. You can either select the Specify On-Screen check box in each area to specify the parameters onscreen at the command prompt or type the values you want in the text boxes in the Insertion Point, Scale, and Rotation areas. Select the Uniform Scale check box to constrain the X, Y, and Z scaling parameters to the same value. If you want AutoCAD to create a copy of the individual objects in the block instead of a block reference that points to the block definition, select the Explode check box and click OK. If you selected the Specify On-Screen check box for the insertion point, scale, or rotation angle, answer the prompts on the Command: line to specify these parameters. After you insert a block, all the objects displayed in the block reference behave as a single object. When you select any object in the block reference, AutoCAD highlights all the objects in it. Drag and drop: Drag a DWG file from Windows Explorer and drop it anywhere in the current drawing window. 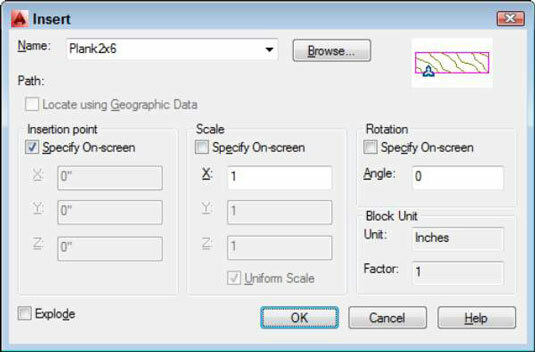 AutoCAD then prompts you to choose an insertion point and (optionally) change the default scale factor and rotation angle. The DesignCenter palette: Drag a block definition from the Blocks section of the DesignCenter palette and drop it into the current drawing window. You can import Inventor part (IPT) and assembly (IAM) models directly into AutoCAD 2013 and later. Inventor is AutoCAD’s 3D parametric and associative sibling, intended primarily for mechanical design. Imported Inventor files come across as “dumb” 3D solids that lose their parametrics and associativity, but they can be modified and edited like any other AutoCAD 3D solid. The Tool Palettes window: You first must create and configure appropriate tools. The easiest method is right-clicking a drawing in DesignCenter and choosing Create Tool Palette. A new tabbed page is added to the Tool Palettes window, containing all block definitions from the drawing you right-clicked. Simply click and drag a tool to insert its corresponding block into a drawing. Dragging blocks from a tool palette doesn’t give you the chance to specify a different insertion scale, nor can you use all the precision tools in AutoCAD to specify the insertion point precisely. So you may need to move the block into place after inserting it. You should first master the other block insertion methods, especially using the Insert dialog box and DesignCenter palette. Then if you find yourself inserting the same blocks frequently, consider creating a tool palette containing them. Check out the Add Content with DesignCenter topic in the AutoCAD online Help system for more information. Although the preceding paragraph refers to the Tool Palettes window, palettes in AutoCAD aren’t like regular windows or dialog boxes. They’re modeless, so they can stay open while you carry out other tasks outside them. The official programmer-ese term for the palette is enhanced secondary window, or ESW. Be careful when you insert one drawing into another. If the host (or parent) drawing and the inserted (or child) drawing have different definitions for layers that share the same name, the objects in the inserted drawing take on the layer characteristics of the host drawing. For example, if you insert a drawing with lines on a layer named Walls that’s blue and dashed into a drawing with a layer named Walls that’s red and continuous, the inserted lines on the Wall layer turn red and continuous after they’re inserted. The same rules apply to linetypes, text styles, dimension styles, table styles, multileader styles, and block definitions that are nested inside the drawing you’re inserting. To modify a block definition after you’ve inserted at least one instance of it, use the BEdit (Block Editor) command; choose Block Editor in the Block panel on the Home tab, or simply double-click a block insertion.